All items are worked in double knitting wool. 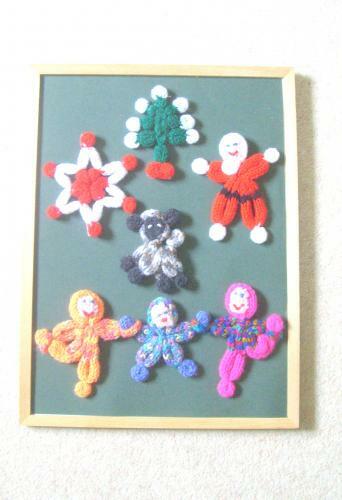 They are suitable for children to knit, but you may have to give a hand cutting and tying the wool and then sewing up. Required Knitting spool and tapestry needle, variety of DK Wool, measuring tape, scissors. Dolls can join hands, dance, relax etc. Christmas decorations can hang on the Christmas tree or be an outsized brooch!